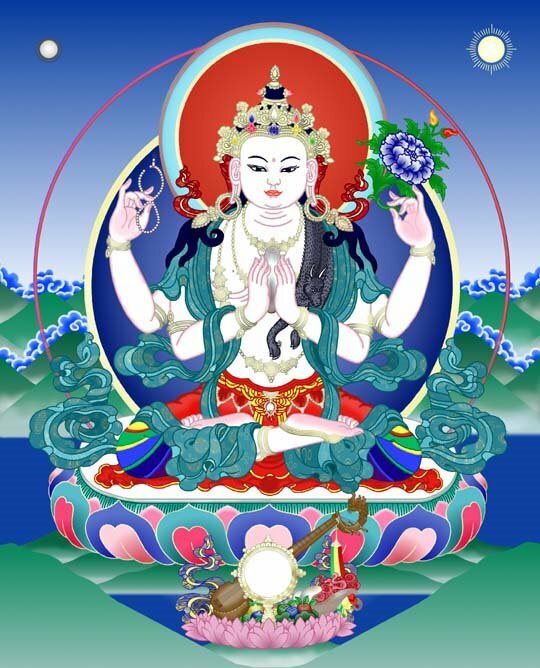 Mental Blog: Lama Chants Ancient Mantra! 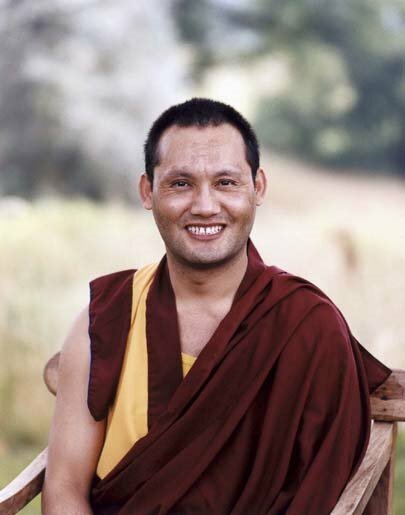 HWSRN announced today that Lama Karma Phuntsok, a Tibetan monk of the Karma Kagyu order, spent last evening making a recording of Buddhism’s most famous and enduring mantra, Om Mani Padme Hung. This mantra, recited and chanted daily by millions of Buddhists around the world, is said to contain the essence of the body, speech and mind of Chenrezig, aka Avalokiteshvara aka Kwannon, the revered bodhisattva of compassion. The recording reportedly took place in an isolated home studio somewhere in the southwest section of Lunchbucket. Lama Phuntsok was unavailable for comment, but HWSRN speculated that the purpose of making the recording was to demonstrate the emptiness of sound in the digital age. OK, so you’re wondering what’s so surprising about a Tibetan monk chanting a mantra. It would be more astonishing if he were not doing so. What’s different about this particular recording is that it was done to music composed by HWSRN. HWSRN has put together a rather New-Agey piece approximately ten minutes long and given the ancient mantra a westernized treatment, ably assisted by buddies Voin and Paulie on guitar and bass respectively (not to mention editing wizardry). Lama Phuntsok blessed the project and gave it true authenticity by chanting the mantra in his own inimitable way. Only two takes were required to capture his performance, the first having unfortunately not been recorded. This is certainly a historic moment in the region, as Lama Phuntsok becomes the first Tibetan monk in Lunchbucket to make such a recording. Other recordings are sure to follow. The immediate plans for Om Mani Padme Hung are to release it as part of the disc previously mentioned in this blog, This One’s For Kenny by the local collective known as 2 Cents Left. The project’s director, Voin, said, “We’ve got everything in this recording from Alpine yodelling to animal sounds to church bells, whales and a twenty second scream…Why wouldn’t we have a Buddhist chant?” In all likelihood, the recording will also be released later as part of a collection of more strictly Buddhist recordings. This One’s For Kenny is, of course, still not quite ready for prime time, but its release is imminent. Really. Meanwhile, the recording continues with additional chanting by the Dharma Pips and the Karma Kagyu Koir. Stay tuned. Sheesh, Larry, you keep tantalizing us with this wonderful recording... so when will it be released???? Anyway, there is a story there - no doubt. Her songs are also being played quite a bit in Europe in dance clubs, I believe... I think Sam said they were working on the German mix?? ?